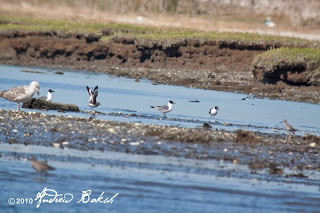 After the Earth Day project on Saturday, April 25th I did some birding at Jamaica Bay Wildlife Refuge with friends, Joan Quinlan, Gerta Fritz and Pat Lindsay. During our hike around the West Pond Trail, we talked about keeping an eye out for a possible White-faced Ibis that could show up anytime. We did not find any that day. 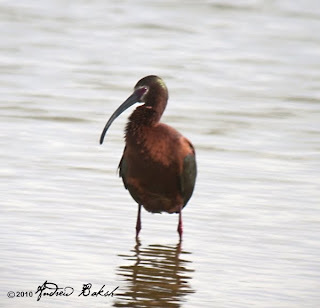 However, on Monday April 26th, I got a phone call from birder Shane Blodgett, who relayed that he had found a White-faced Ibis (Plegadis chihi)at the Refuge. 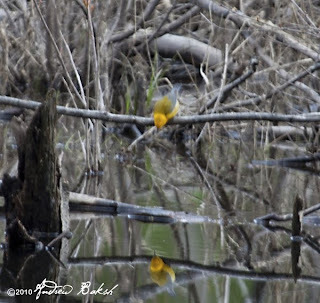 Unfortunately, I could not get out right then to get the bird and so I waited until yesterday, Wednesday April 28th. 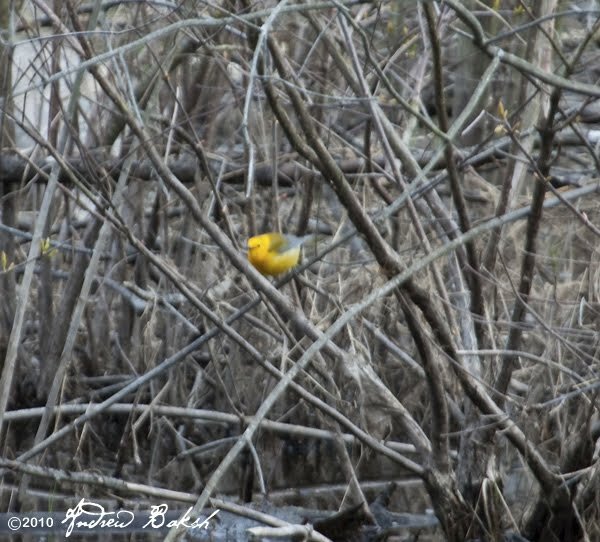 It took some amount of searching, but I finally found the bird way out in the Marsh. I patiently observed the bird for well over an hour and was rewarded with one decent photograph as the White-faced Ibis came in on the West Pond mudflats after it was flushed out of the marsh by a Northern Harrier. The flock of Glossy Ibis' that was with the White-faced Ibis were very skittish and I only got off 2 digiscoping shots before they took flight. I felt very lucky to have gotten the looks that I did of this bird and silently thanked the Northern Harrier for the flush. According to NYSARC records, this would make the 8th record in Queens if it is accepted. 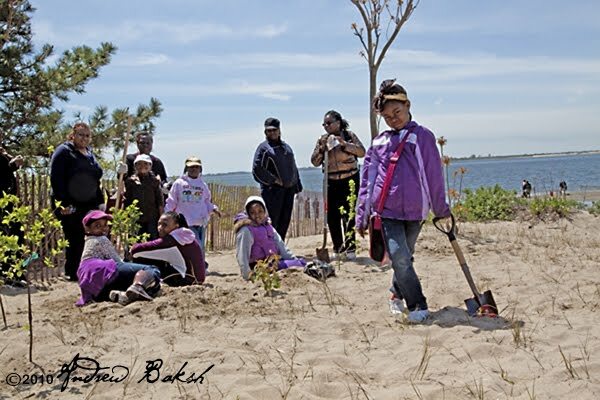 When my friend Don Riepe, asked for my support with an Earth Day project at Jamaica Bay on the 24th of April I realized I had a scheduling conflict. I had planned on going on a butterfly walk in the New Jersey Pine Barrens with naturalist and author Rich Cech. The thought of missing out on potentially several life butterflies and being out in the field with some of the best naturalists would probably be reasonable cause for second guessing, but I made my decision with no regret. Jamaica Bay, is far more important and I agreed to throw in my support and help on the Earth Day initiative. April 24th came and the turnout for the event was tremendous. 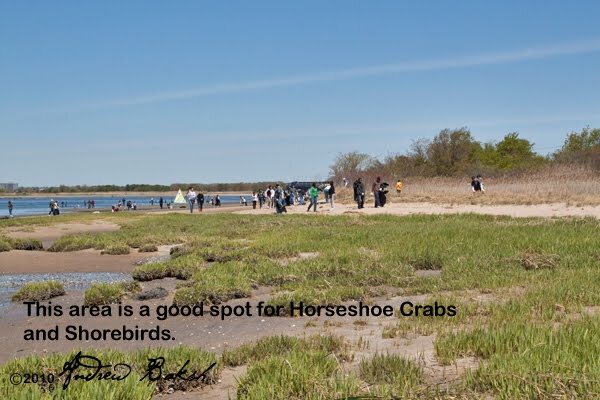 Over 100 volunteers showed up for a cleanup and restoration project at an area around the North Channel Bridge; a location that is known to host Horseshoe Crabs and many birds. Volunteers began working around 9:30 a.m.; Breaking up into groups and tackling several areas. 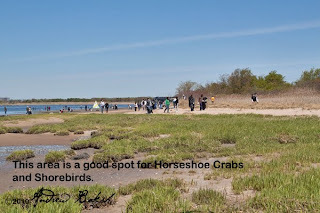 I took a group near the marsh next to an area known as the “railway”; a spot where I have photographed Horseshoe Crabs and Shorebirds. Later in the afternoon, we also planted Beach Plums (Prunus Maritima) and Shadblow Serviceberry (Amelanchier Canadensis). Many non-profit groups were in attendance including, American Littoral Society, Jamaica Bay Eco Watchers, Jamaica Bay Task Force, Visiting Nurse Services, Sebago Canoe Club, Shiri Trimurti Hindu Temple, DEP, Bloomberg, NPS Gateway National Recreation Area, NYC Audubon and others that I am probably missing. There were also many locals that came out in support of the event. I was especially pleased to see in attendance members of the Shiri Trimurti Hindu Temple. The Hindu community has come under fire for illegal dumping of non-bio degradable religious artifacts in the area. A common misconception among many is that all temples engage in this type of activity. Having a group like the Shiri Trimurti in attendance goes a long way in demonstrating that not all groups participate in the illegal dumping. It also helps to build a working relationship with Gateway National Recreation Area officials in addressing these types of issues. 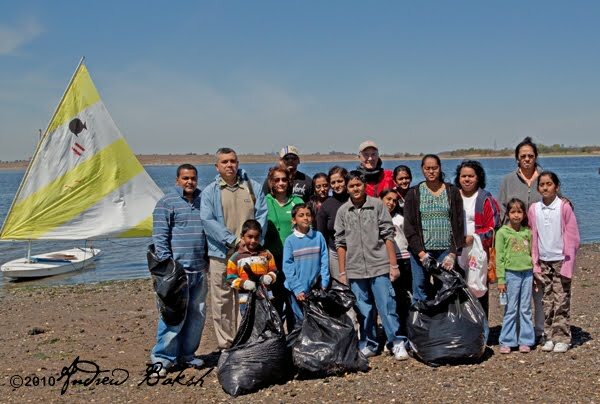 Hopefully, Shiri Trimurti could take on the lead as an ambassador in spreading the word among their fellow religious communities on how dumping can adversely affect the wildlife and environment at Jamaica Bay. Click here for more photos from the event. 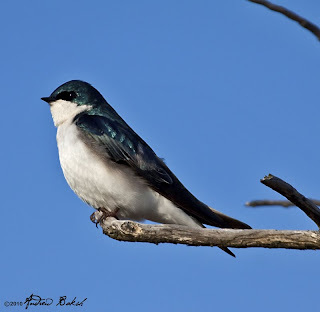 On April 17th, I had spent the morning doing some nest box monitoring at a few locations in Gateway Recreation Area (more on that in another post) and did not plan on doing any birding. 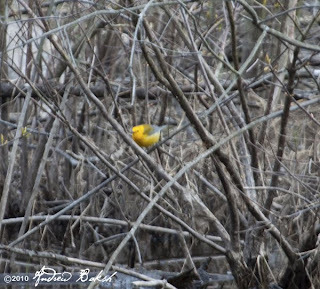 However, after reading a message about the Prothonotary Warbler seen earlier at Fuch’s Pond in Northport LI, I decided to make a late afternoon run. It so happened that my friend, Joan Quinlan, called to report on her birding for the day and I asked if she would be interested in the run. Joan was probably tired from her earlier bout of birding, but she was up for a chase. Around 4:30 p.m., we met up at Sunken Meadow State Park and from there we took one vehicle to Fuch’s Pond. 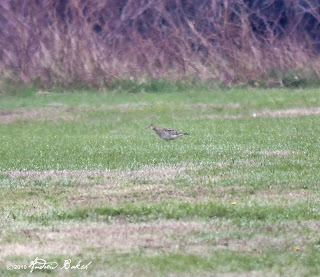 After 2 hours of searching and waiting for the bird to show, we called it a day, as the light was fading. Undaunted, I told Joan that I was going to return the next day for another shot, though much earlier. The next day, I made the hour drive in short order and was at the pond around 7:30 a.m. 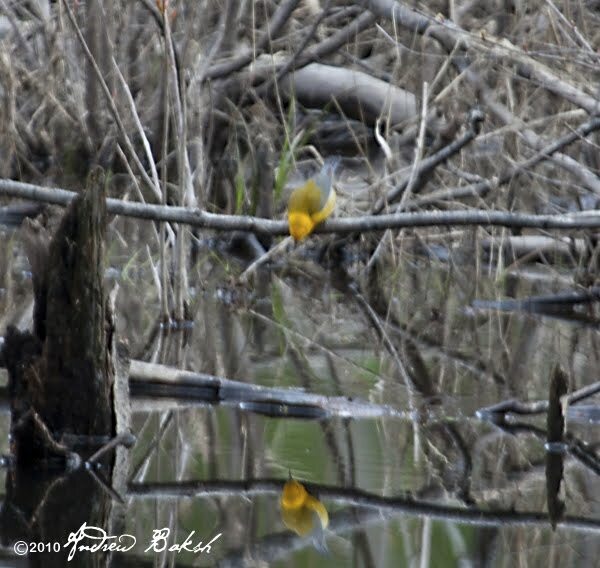 There were a couple of birders already there, but they had not seen the bird. Other birders soon joined and took up strategic positions around the pond. 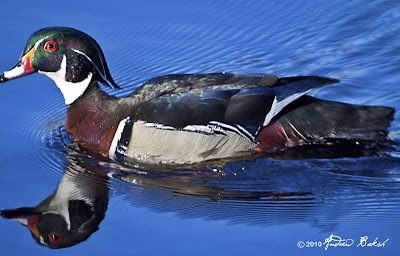 It was Gail Benson who had arrived with Tom Burke that first spotted the bird when it flew in from the woods and I relocated it among the brush in the middle of the pond. What a spectacular looking fellow. We got everyone at the scene on the bird, which kept disappearing into the brush and we had to really be on our toes not to lose him. By 8:30 a.m. 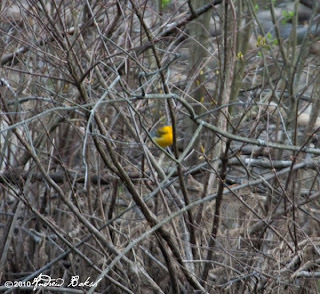 I spotted Joan entering the trail towards the pond and I waved her over. She was able to get on the bird as well and so we were both quite pleased to pick up the bird. Leaving Fuch’s Pond we birded at Makamah Preserve, then at Sunken Meadow State Park. 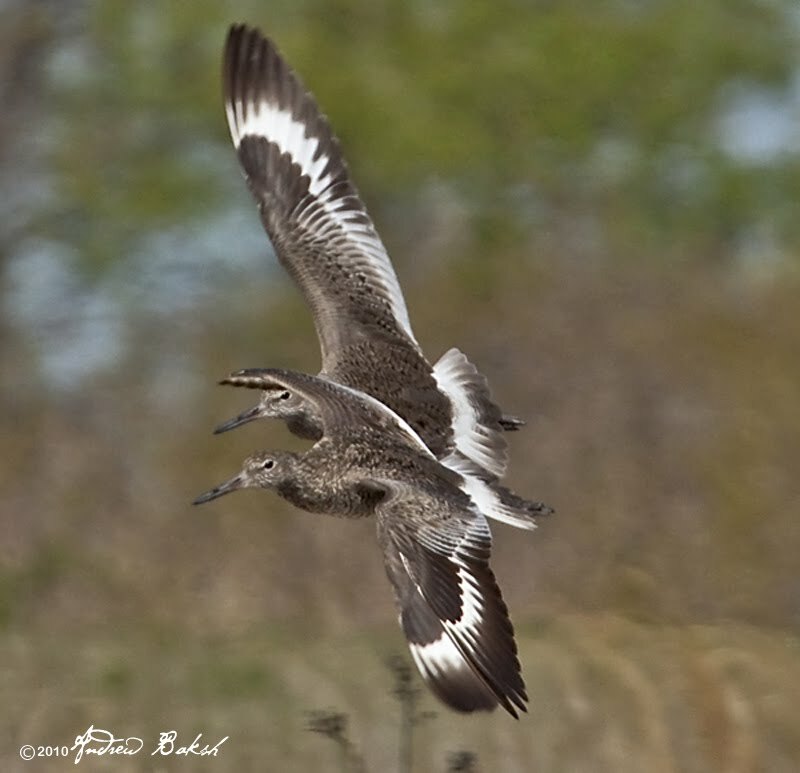 A dead cell phone resulted in a missed phone call from Tom Burke about an American Golden Plover that he and Gail had found at Cedar Beach. 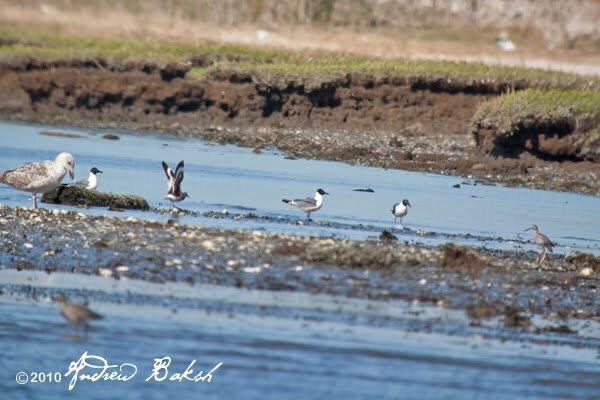 We did try after the word finally reached us, but after spending 2 hours sifting through various flocks of Black-belied Plovers we could not turn one into a Golden and we reluctantly accepted that we had dipped. 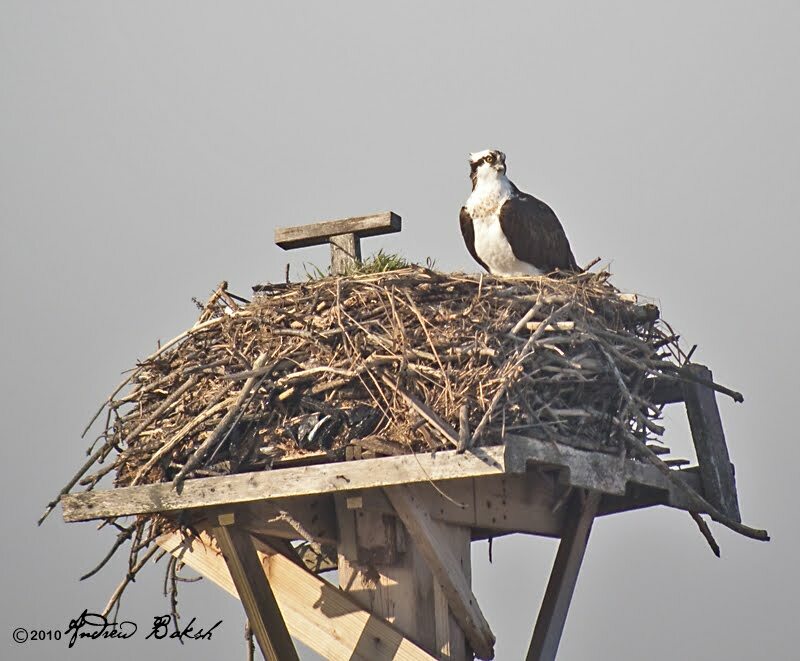 Later on, we joined friends Shai Mitra and Pat Lindsay for happy hour sharing our birding adventures of the day. 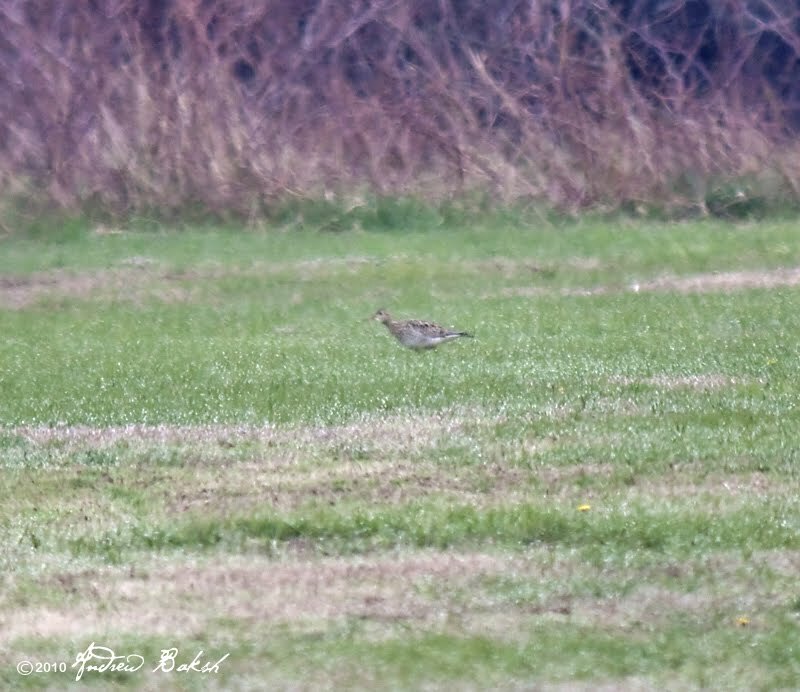 Digiscoped shot of the Upland Sandpiper at Fire Island. 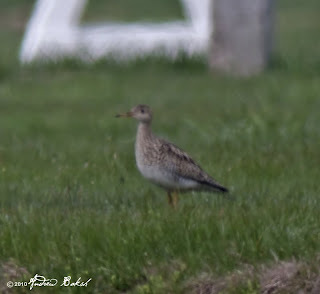 On Monday, I did not learn about the Upland Sandpiper until I sat down at the computer and saw the e-mail, indicating that Shai Mitra had found an Upland Sandpiper at Robert Moses State Park Suffolk County LI NY. Once I saw the post, I got on the phone to call folks I figured might be out and about only to find out that some folks had already gotten wind of the bird being found. I decided against going out to try for the bird and figured that I would give it a shot the next day. By 8:00 a.m. on Tuesday, I was prowling around the entrance to Field 4 when another birder Ken Fuestel drove up just past me. Ken hung around for a few minutes and then headed towards field 5. I caught up with Ken a little later in the parking lot and we exchanged intelligence. Neither of us had seen the target bird. Ken indicated that he was heading down to Jones Beach West End and I decided that I would stick around and prowl some more. Half an hour later as I pulled out of Field 5, I noticed a car pulled over to the side of the median and I realized there was someone with a scope. I knew right there that the bird was around. 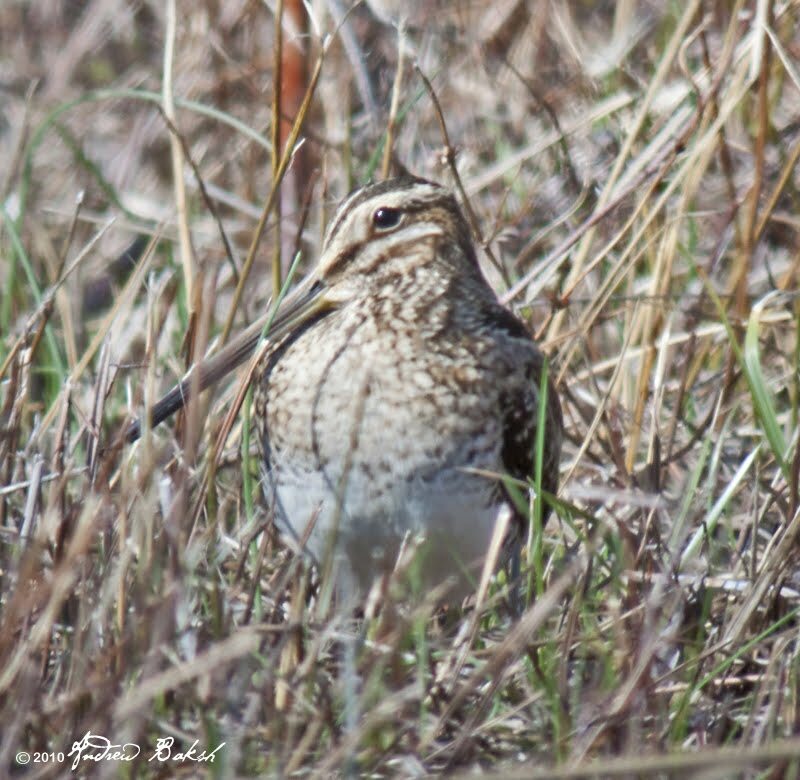 It was birder, Bob Adamo, and he had relocated the Upland Sandpiper. As I got off on one of the turn around, I noticed another car pulled over to the side. I did not recognize that it was another birder, Gerta Fritz, who had pulled over and was trying to call me (a kind gesture indeed). I immediately got the bird in Bob's Scope and then looked at it through my bins then had my own scope views. Gerta joined us soon after. Eventually, we moved our vehicles to avoid any hassle from the Parks Department and then walked back to the location of the bird. The person I thought of was Ken. 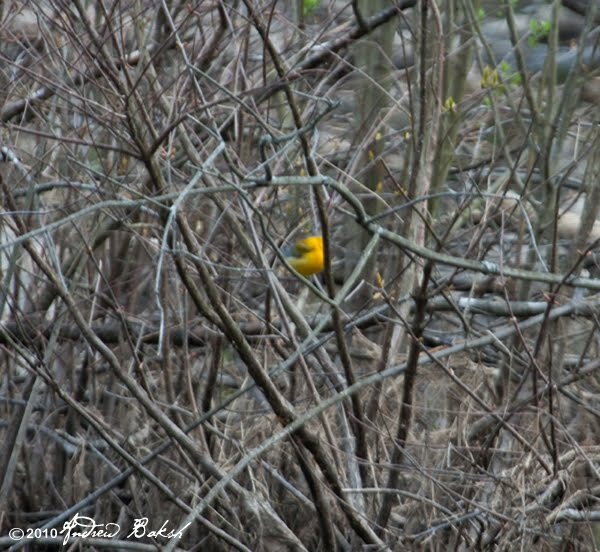 He should see this bird as he was there looking for it early that morning. So we tried to get in touch with him. We all waited for Ken, but just before he got there the bird flushed due to the excessive traffic with the numerous trucks carrying sand that was being used to repair the beach erosion. When Ken got to our location, we told him the bad news. I then, volunteered to stay and look for the bird with him. I felt that the flight pattern seemed to indicate that it could not have gone too far. We first checked the beach, then the sand dunes around field five, then walked around field five all the way near the traffic circle, then circled back and it was then we picked up the bird along the median. 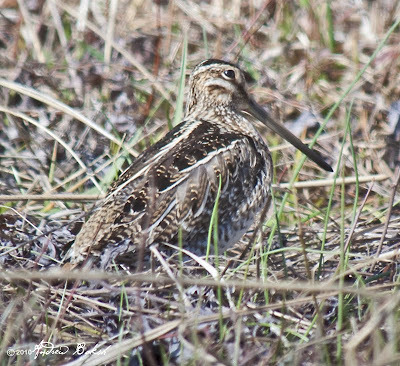 We had good looks, but once again the traffic caused this bird to shy away into the tall grass. Satisfied with the looks, Ken and I parted ways again and I continued on to Jones Beach and other locations. 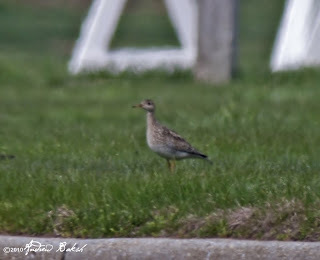 This was only my second Upland Sandpiper and the best looks for me, so I totally soaked it up. I hope others get to see this bird before it decides that it needs to continue on. Before I begin this post, let me just say that the following comments on Greater vs Lesser is purely from a newbie and humble perspective. I don't claim any expertise with the species and only share what I understand in the hopes it might help others. There are those days where I simply go out into the field and pick a species to spend some time to study and review what I have learned. 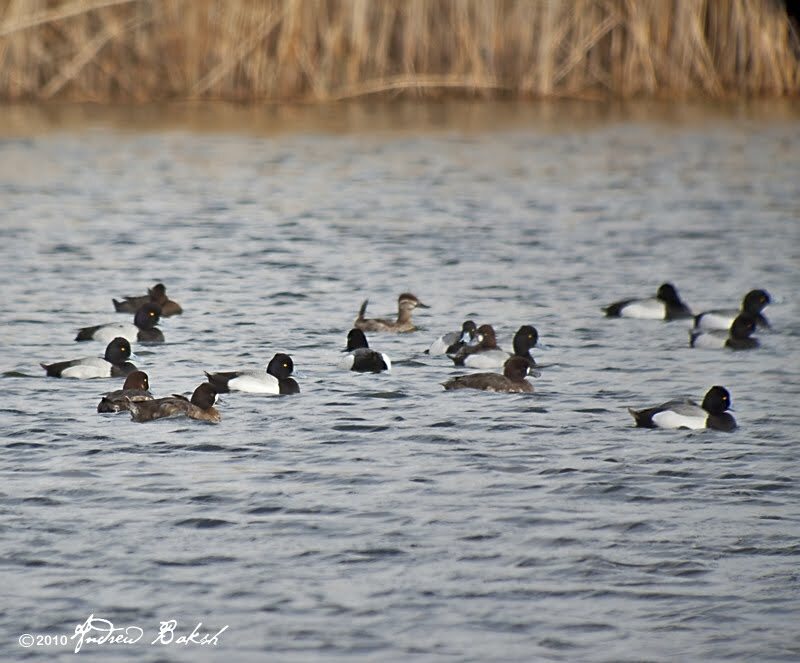 On the 31st of March, I ventured out to Jamaica Bay Wildlife Refuge to put in some time looking at Scaup. 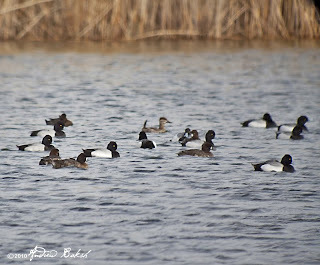 Just a few weeks ago there were well over 5,000 Scaup on the West Pond and it made sorting through them quite the task. However, as I have learned from being in the company of very experienced birders, like Shai Mitra, Patricia Lindsay, Tom Burke and Gail Benson. One must remain "focused" while tackling large flocks of birds. So, with this huge raft of Scaup, I tried to apply what I have learned (from some of the best) and in doing so chose to go through this exercise by taking small amounts of ducks at a time. 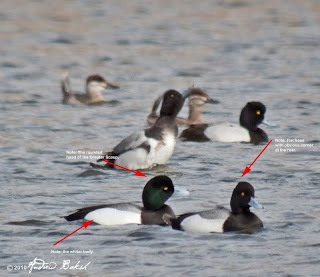 It was fun and I took some documentation digiscoping shots to show the comparison of the Greater vs Lesser Scaup. 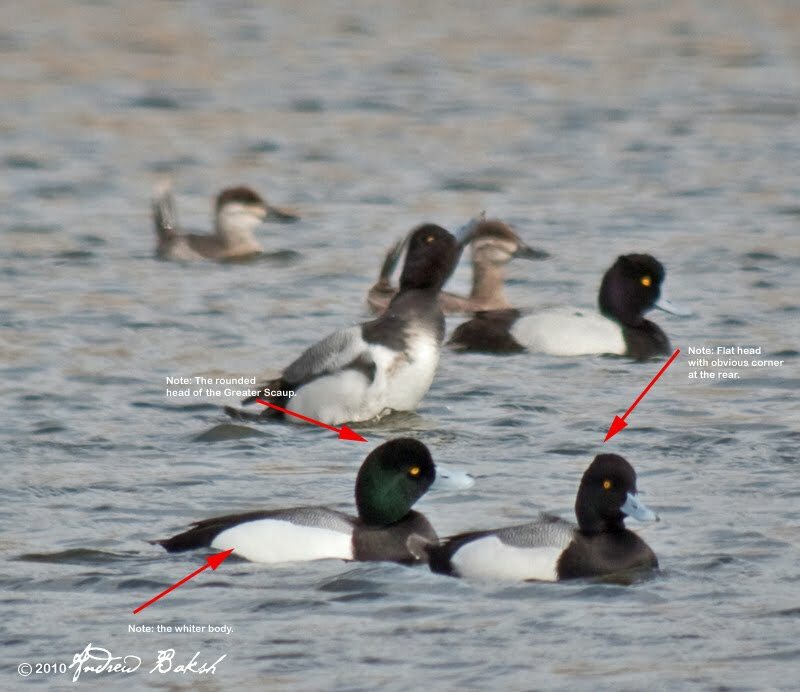 Quite a few diagnostic features stood out, such as the head being taller in a Lesser Scaup showing the obvious corner at the rear. 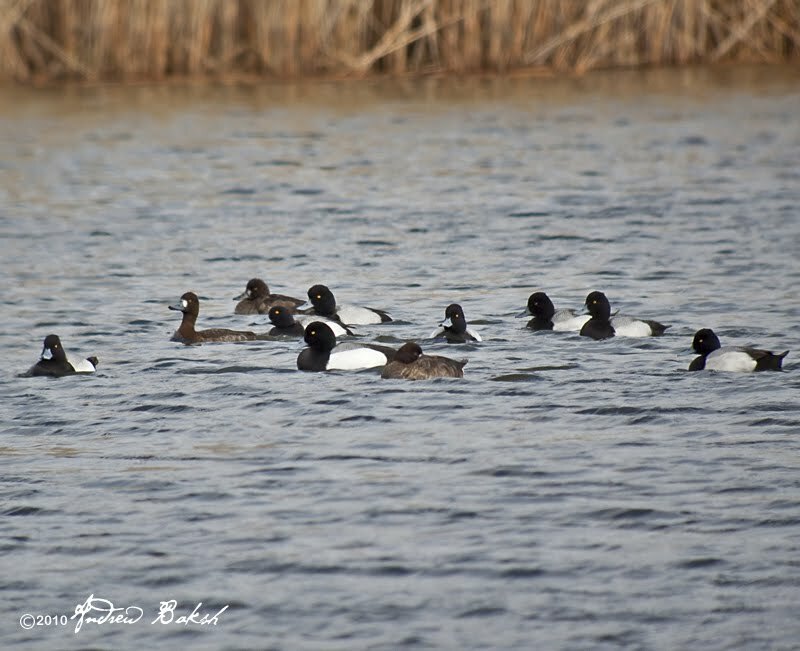 The body or flanks of the Greater Scaup being much whiter than a Lesser. All of these features are well covered in the Sibley's Field Guide To Birds of Eastern North America. 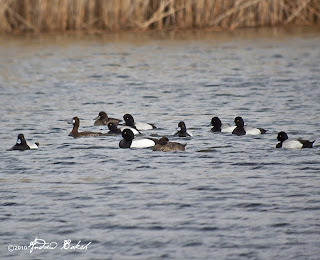 There were some other things I noticed, one item in particular that I need to get additional photographs of Greater and Lesser Scaup to see if there is any consistency, so this might be a post that I circle back to at a later date. Hopefully the photos from this post provides a realistic look at what is presented live in the field and helps in nailing down the ID. We had a few days of warmth and with it came some of our early spring migrants. 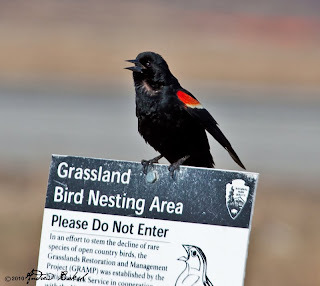 On Sunday, March 21st before I went for my Piping Plover volunteer event, I birded Big Egg Marsh, Jamaica Bay Wildlife Refuge West Pond and Floyd Bennett Field. I was on a tight schedule, so I did not get to work over the areas as well as I would have liked. 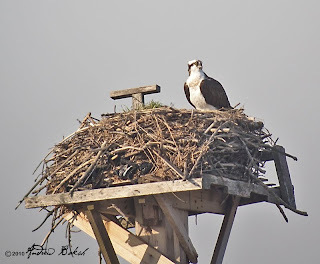 Nevertheless, I picked up several FOS (first of the season) birds like Great Egret, Tree Swallow, and Osprey. Since then, we had a cold spell and yesterday and today saw a lot of rain. 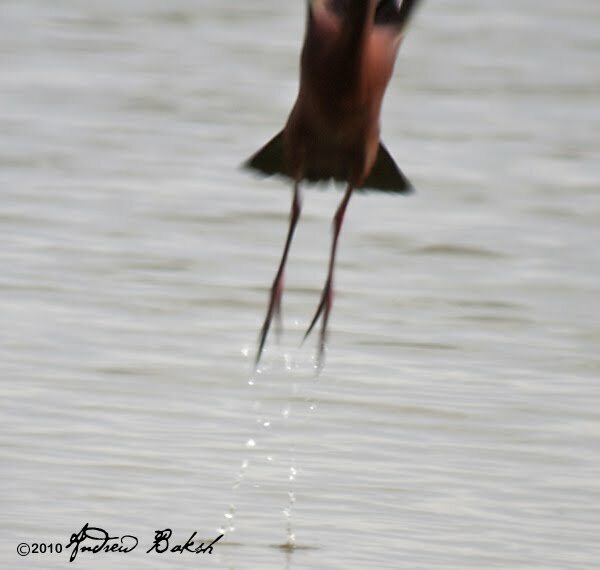 It is still early, but hopefully, dry and warm weather in the next few days, bring new migrants into the area.